After a couple of years of abstinence, I bought myself a new guitar and a new amp. Since I wasn’t really happy with my Gibson Les Paul LPJ 2014 (tonally), I got myself a Fender HSS Strat (Made in Mexico) this time. It was the mid-ish tone that I didn’t like with the Les Paul. The guitar itself was beautiful and it was really fun to play with. But I figured that I’M more that blues kind of guy. So I’m going to try the Strat this time. Since I sold my old amp (Blackstar HT-5 mini stack) as well, I had to get a new amp. I’ve chosen the H&K, because it had the widest range in sounds you can choose from. Two separated channels, foot switchable. Plus, the H&K TM18 has a powersoak with 18, 5, 1 and 0W, which allows you to crank up your powertube even at home, playing with 1W of power. Unfortunately, the TM18 does not have reverb on board, so I had to buy an additional Reverb pedal, where I chose the TC Hall of Fame Mini. If you already have a mixer with an XLR mic input, you can simply connect the amp to the mixer and hook up your headphones to the mixer. The most modern way would be to use a computer interface (mostly USB), because most of those will also have a headphone jack. They’ll cost you about 100€ at least. The most old fashioned way is using a headphone amplifier. In most cases a USB interface will be cheaper. But an issue is power supply. Most of the devices will have an external power supply with some exotic voltage, which I generally hate. 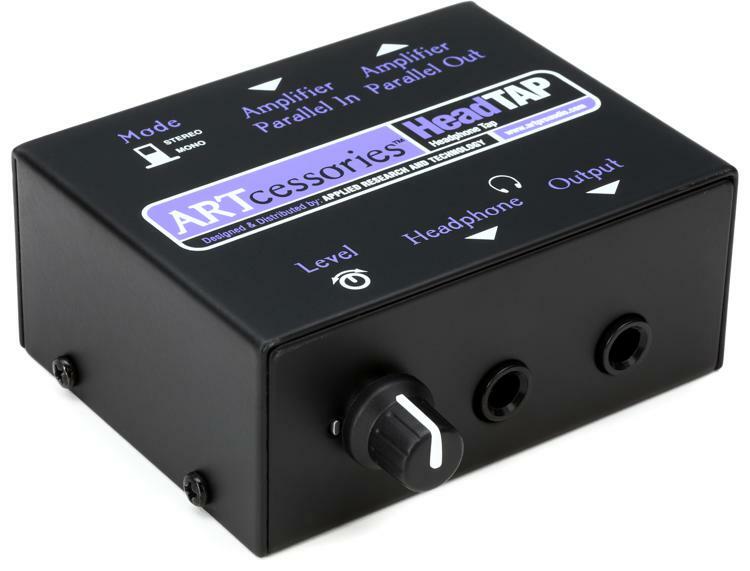 But I found a neat passive headphone amp, the HeadTAP by Artcessories. This will cost you around 50€ and it acts like a simple converter. On the input side you can connect it to the amp using a XLR-to-Klinke cable. On the output side you can connect your headphones. No external power supply needed. I found the sound to be pretty awesome.I’ve read that the built-in redbox of the TM18 emulates a four by twelve cabinet. The amplification poti is cranked up completely, but the loudness coming out is sufficient for my taste. A couple of days passed by and I’ve used the amp extensively. The other day, I wanted to record sound for a song cover for youtube and the passive solution mentioned above wasn’t really satisfying, mainly because the input signal on my macbook was too low. So I decided to go all USB and purchased the Behringer U-Phoria UM2. It’s a USB interface for audio recording. It has two inputs: one combined XLR/6.3mm jack and one secondary 6.3mm jack. It also has two outputs: USB and RCA. Plus, there’s an additional 6.3mm jack for monitoring, which is where you can plug in your headphones while playing. I used the interface to do some audio recording with garageband on my macbook pro. As an IT guy I was really impressed, because the USB interface was detected automatically by OSX. No need to install any drivers or specific piece of software. I plugged it in and it was recognized out of the box, immediately usable in garageband. The interface itself has two neat LEDs on the front showing you if there’s any signal coming through and if the signal is being clipped. So you’ll see if the signal is too low or too high. Altogether, the Behringer U-Phoria UM2 is a very useful USB interface for small money. It costs about 30€, which is very fair in my opinion.